It can indeed be rather difficult to understand the differences between Anglo-Saxon warriors and the Norse Vikings. Even today, information is scanty, and must of necessity be gleaned from literary sources and a few rare archaeological finds. The basic Anglo-Saxon weapon was the spear. Its effectiveness was underscored by the fact that everyone from great lord to humble thegn used it. There were several types of spear, but the two major categories were the light javelin and more sturdy thrusting spear. Javelins were launched early in a battle, “gadfly” shafts that were best thrown en masse. Once an enemy was “softened up” by the javelins, it was time to close with thrusting spears, generally held overhand. The thrusting spear varied greatly in size, but generally was about seven feet in length, tipped by a broad leaf- or lozenge-shaped head. By contrast, only high-ranking Anglo-Saxon warriors used the sword. Blades were about 30 inches long and three inches wide, designed for slashing, not stabbing. Much more universal was the scramaseaxe, a long knife that was used by peasant and king alike for everyday tasks. These greatly varied in size, ranging from about 6 to 10 inches in length. As previously discussed, higher warriors would wear mail shirts, rows of interlocking metal rings that in this period fell to the hips. Those who were lucky enough wore iron helmets, conical headgear that featured a projection in the front called a nasal. Shields were generally round and made of linden wood. Linden was ideal because it was relatively light, yet resisted splitting. They were painted in various colorful designs, and in the center was a metal boss. 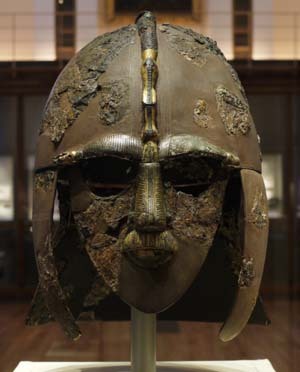 Anglo-Saxon helmets are rare finds, but one discovered at York suggests they could be both functional and works of art. The York artifact, called the “Coppergate helmet” after the archaeological site where it was found, is edged in brass. The brass nose guard features an interlocking animal design of a style that suggests the period of about 750 ad. The helmet shows signs that it was already old when discarded, leading some to speculate it was lost when the Vikings took York in 866 AD. The principal Viking weapon was the sword. Sword hilts were often decorated with elaborately designed copper, silver, or gold inlay. The broadaxe was used so frequently it almost was a symbol of Viking terror. When wielded in the hands of an expert, the broadaxe deserved its fearsome reputation; it was able to cut off a horse’s head in one stroke. In general, the Vikings dressed much like their Anglo-Saxon opponents. A woolen tunic, breeches, and perhaps a cloak for colder weather were all standard costume. Vikings were hardy seafarers as well as warriors, who didn’t need much in the way of personal baggage. Helmets do not seem to have been as universally worn as was previously supposed. Popular culture associates Vikings with horned helmets, but these seem to be largely flights of Victorian fantasy. A horned helmet would not be the best thing to wear within the closely packed confines of a shield wall, and would probably make you more dangerous to your comrades than to the enemy! Similarly, the winged helmets of Wagnerian opera have no basis in fact. Tags Anglo-Saxon, axe, England, javelin, Norse, spear, sword, thegn, Viking, weapons.